Lawyer Selcuk Kozagacli who is the president of Progressive Lawyers Association that was shut down with an emergency decree was arrested in Istanbul after 5-day police custody. Today, Kozagacli was taken to the Istanbul Courthouse located in Çağlayan. After questioned by the prosecutor, he was referred to the Istanbul 10th Peace Criminal Judgeship for arrest and got arrested on the charge of to be the member of DHKP/C terrorist organization. 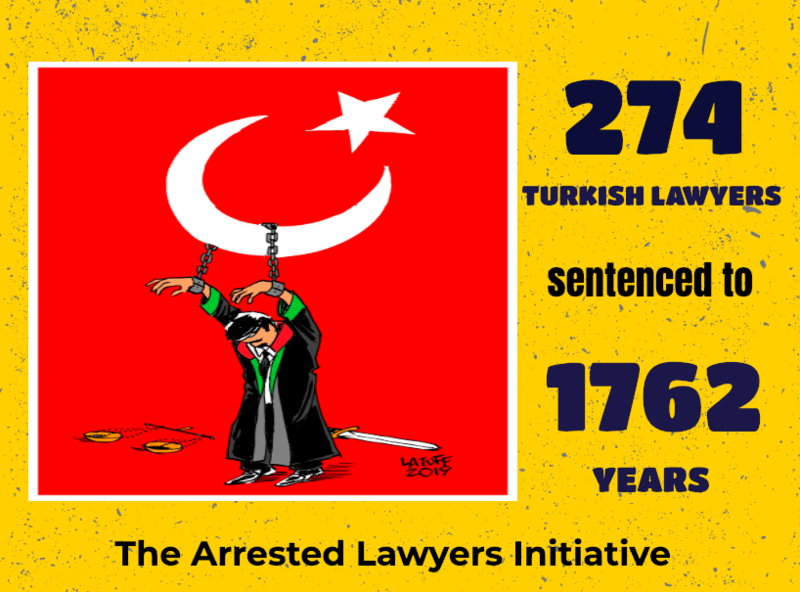 Kozagacli and 15 other lawyers were prosecuted with the same accusation between 2013 and 2014 and were acquitted by Istanbul 23rd High Penal Court. Many national and international law societies and bar associations denounced his detention and arrest. 40 lawyers who have been under arrest for months were indicted with the charge to be the member of the armed terrorist organization. Istanbul Public Prosecutor seeks up to 15 years prison sentence for lawyers Orhan Erdemli, Abdulkadir Şeker, Abdullah Şen, Adem Yılmaz, Ahmet Düzgün, Burak Kemal Tanrısever, Deniz Atmaca, Engin Emrah Biçer, Erdal Sarıkaya, Erol Ergüder, Gazi Tanır, Gültekin Avcı, Hasan Günaydın, Hürol Karadaş, Kadir Kökten, Kamil Ata, Kani Öztürk, Mehmet Öksüz, Metin Fatih Mergen, Muhittin Yılmaz, Murat Kılıç, Mustafa Aydın, Mustafa Çağlar Akgün, Nazif Aktaş, Onur Çeliktaş, Osman Yalçın, Önder Yılmaz, Rahmi Arslan, Selami Kurt, Selim Özkan, Seyfettin Dayan, Sıddık Filiz, Sinan Dengiz, Suphi Bat, Şeref Polat, Tayfun Aktaş, Ulvi Murat Atabey, Vural Ergül, Yılmaz Çiçek ve Yusuf Avni Kapacaoğlu. Eight lawyers have been under police custody since 1st of November in Kastamonu with the charge to be the member of the armed terrorist organization. Since we have not reached more details yet, we can’t provide more information regarding the current situation of fellow lawyers. Seven woman lawyers have been under police custody since 8th of November in Erzurum with the charge to be the member of the armed terrorist organization. Lawyers are still being held in Erzurum Police HQ to be interrogated by prosecutors. On 10th October, former President of Erzurum Bar Association, lawyer Mehmet Guzel who is under arrest since 4th August 2016, was sentenced to 13 years imprisonment with charge of to run armed terrorist organisation; along with him, 4 other lawyers (MSB, SA, ŞYL, HD) also were sentenced range to 1 and 5 years imprisonment in Erzurum. A lawyer was taken into police custody on 2nd of November with charge to be member of Gulen Movement in Batman and released after interrogated by prosecutor.